The Village, Howard Norton Cook, 1928, California State Library. Márquez’s fictional town of Macondo functions like his magical realist writing: it is simultaneously marvelous and banal. It is a town where the locals gawk at ice, but barely bat an eye at a boy who is perpetually followed by a swarm of butterflies. While Macondo first appeared in Marquez’s novella Leaf Storm, the town is most famously associated with Márquez’s 1967 masterpiece, One Hundred Years of Solitude. That novel follows the rise of Macondo from a tiny village to a large city before ultimately—spoiler alert!—being blown off the map by magical winds. The town is assumed to be a stand-in for Marquez’s (presumably non-magical) childhood town of Aracataca, Colombia. Aracataca actually held a referendum to rename itself Aracataca-Macondo in 2006 to honor Márquez, but the measure failed. 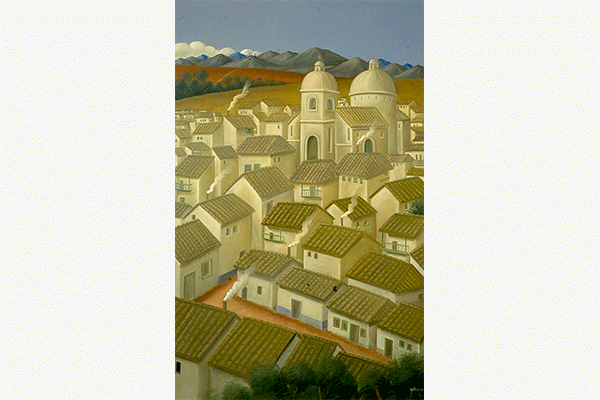 Un Pueblo, Fernando Botero, 1998, Museo Botero, Colección de Arte Del Banco de la la República, Bogotá, Colombia. George Eliot’s 1870s novel is one of the classic works of 19th-century British realism, but the titular town doesn’t exist in real life. Subtitled “A Study of Provincial Life,” Middlemarch presents English provincial communities as being narrow-minded and reactionary to social and political change, while also giving a full and vibrant picture of England in the mid-19th century. Before moving to London, Eliot lived in the Midlands-region town of Coventry, which was likely her inspiration for the creation of Middlemarch. 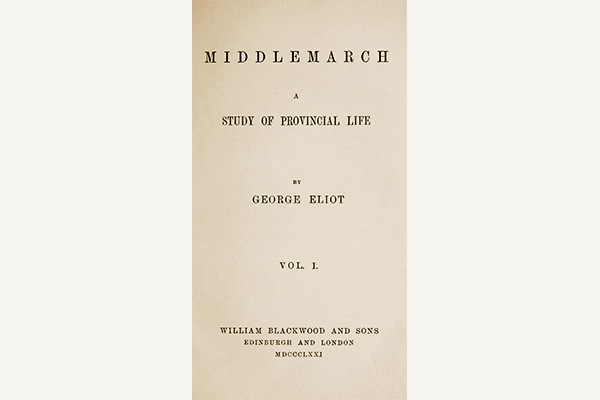 First Edition title page of Middlemarch, George Eliot. Like Middlemarch, The Great Gatsby is a largely realistic novel that is celebrated for encapsulating life in a specific time and place. Instead of 19th-century England, it is Jazz-age America in all its excitement and excess. More specifically, the novel is set among the ultra-rich who live and party in the Long Island suburbs of New York City. The classic novel memorably portrays the class dimensions of American life by tying them to location: West Egg—the primary setting—is filled with the “nouveau riche” like Jay Gatsby. West Egg lies across from the “old money” town of East Egg, whose residents look down on the gaudy West Eggers. In between is the poor working class area known as “the valley of ashes,” which the rich witness as a “dismal scene,” when their trains are forced to stop at the drawbridge. 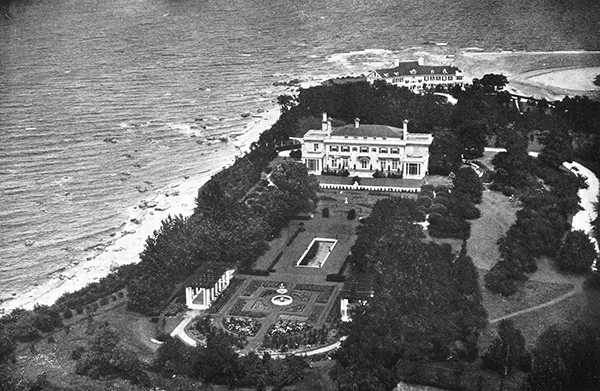 The town and social scene was inspired by Great Neck, Long Island, and the parties of the rich that Fitzgerald attended in real life. Kobo Abe’s Kafkaesque novel The Woman in the Dunes takes place in the most bizarre beachfront village you can imagine. The protagonist is an amateur etymologist who is collecting insects by the water when he misses the last bus back to town. Local villagers take him to their town that is built into the dunes themselves, trapping him with a widowed woman in a house built in a pit in the middle of the sand. He’s then forced, Sisyphus-like, to constantly shovel the sand that threatens to cover and crush them both. Still image from the film adaptation of The Woman in the Dunes, Hiroshi Teshigahara, 1964. Every time you read a horror story set in a creepy small town, you can probably thank H.P. Lovecraft. While Lovecraft himself was famously horrified by his time in crowded city of New York, his genre-defining tales of murder, madness, and eldritch alien gods are mostly set in small New England towns. The best known of these is undoubtedly Arkham, Massachusetts. The town is home to many of the famous elements of Lovecraft’s mythology such as Miskatonic University, whose library holds one of the only copies of the dreaded Necronomicon—a book of black magic that spells out the nature of Lovecraft’s horrifying gods—and the Arkham Sanitarium. The foreboding town has been used by generations of post-Lovecraft horror writers including Robert Bloch and Ramsey Campbell, and the Arkham Sanitarium was the inspiration for the famous Arkham Asylum in Batman comics. H.P. 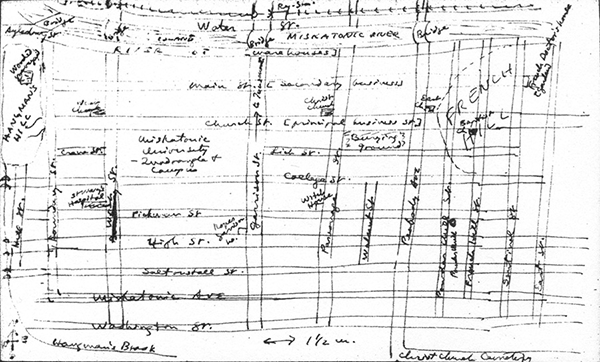 Lovecraft’s Map of Arkham, drawn by the author in 1934. Chiara Clarke SiravoWhat Kind of City is Hell?